I have seen a reproduction of this piece in a friends home for some years now and to think I could have the original would be awesome! I received the painting today. It came undamaged and looks great. Thank You. Wow – I can’t believe how big it is. The one hanging on my wall as a child was about 11 x 14 or so. Wow! I LOVE IT! Thanks for the note Vivien! We’ve had the reproduction of this work for a long time and are excited to own the original. The painting arrived just fine and I am super happy with it! It’s in great condition, I greatly appreciate the letter and all your help with this transaction. Thanks again and I will keep your website in mind for future purchases, I’ve noted a lot of lovely pieces that are for sale. I was reading your testimonials page and that’s exactly how I feel. My grandparents had a reproduction of this Spanish Market painting in their house, which I visited often while growing up. I always admired it, but I didn’t get the copy when the house was sold, so I’ve been looking online to see if another copy of it would turn up. I never thought in a million years that the actual original would ever be available that I might purchase it. I was beside myself when I discovered your website last weekend! What is so special about this painting is that my Uncle had the print in his home for years until he just passed away and his daughter inherited the print. This painting looks so much like my uncle and that’s why my aunt bought the print. After all these years I can not believe I would be able to own the original. The painting arrived today and I am overwhelmed with emotion, it is like you gave my uncle back to me. My Uncle Tom passed away a few months ago and what are the odds that in my search for a print I would find the original as if it was waiting for me, as if I won the lottery, so amazing to see something that old in such magnificent condition and so nice to see my Uncles face looking at me again every time I look at it, there is something special about a painting that a picture cannot do justice, I wanted to thank you your sister and brother for parting with your Fathers collection from what I read he sounded like an amazing man and brilliant entrepreneur, the joy that you guys are bringing to families is something you all should be so proud of. Still hard to believe you had that Mountain Cottage by Monetti also, that hung in our house growing up, holding out a glimmering chance to buy your Free as the Wind someday. It has been an adventure to get the two decorative paintings, “Tending His Flock, and “Watermill” by August Albo. “Tending His Flock” is the best impression of Jesus I have ever seen. “Watermill” reminds me of the backroads I accidently happened upon driving from Germany to France. Having these actual paintings, from the same artist, who painted our families favorite print my grandpa had is amazing! Getting the original “Mountain Cottage”, by Monetti, was a bonus find. My mom had bought it at the green stamp store as a canvas print, and it was lost to the farm. The original hangs proudly in my house now, the same as the canvas print did in the house I grew up in! I believe the two additional mountain scenes you are about to send were painted by Monetti also. The mountain looks identical to the one in “Mountain Cottage” and the shingles are identical on one of the cabins. 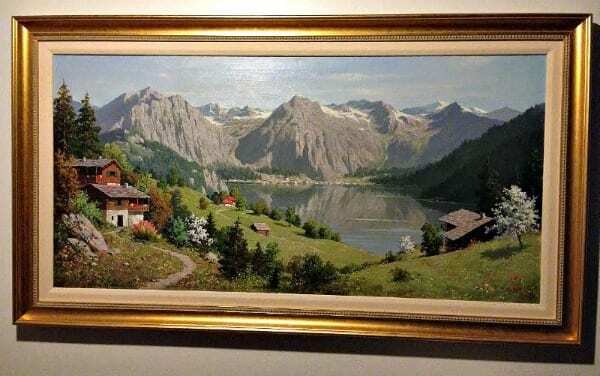 I like to think his paintings are an impression of real places. P.S. – still trying to figure out a way to buy the original of the print by August Albo “Free As the Wind” my grandpa hung on his wall all my life! While it’s not financially smart for me to consider purchasing original art, I honestly cannot see these two paintings go to anyone else. If someone else purchases them, I will regret it for the rest of my life. I have literally been dreaming of owning the original of the girl with the flowers for over 10 years and I used to have a print of the little boy in my bathroom in college. These prints have always been very special to me and owning the originals would bring me joy on a daily basis. The paintings arrived today. They are so beautiful. So very beautiful! I’m just giddy with happiness. Thank you again for working with me, shipping them so well and … thank you for the paintings. I love them! This was such an indulgence for me and I’m swimming in the pleasure of it! I’ve been in touch with Elmore Brown’s family – trying to learn a little more about him. He was so talented. The last Lex Gonzalez and Shi velvet paintings arrived a few days ago. Thanks again for the ease and expedited professional handlings in these sale transactions. 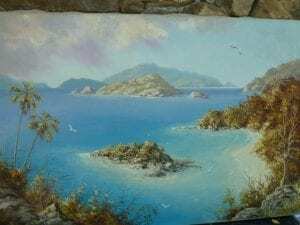 The paintings were all as described and shown in your website and I am very happy with the price and condition that they arrived. My Father has had a framed print of this painting from the early 70s. It been to Seattle, Ireland, back to Seattle and now its with him in Arizona. It’s pretty cool to get the original for him. I must tell you that when I was 12 – 13 years of age, a couple of family members and I went to a local store to purchase a mothers day gift. This happened in 1972. The store’s name was Coronet. We all chose our own unique gift for my mother. I picked the reproduction of the painting I just bought from you. The cost was $15.00 dollars. Both of my parents are now deceased and most of my family members have gone their own way, the copy of the painting is still hanging in one of the walls. I managed to fix the frame that came apart and although the image has faded, i was able to restore some of the colors by spraying it with a clear coat of spray paint. Even though the print has faded, was in storage in the back shed, and the frame came apart I have not been able to part with it because it still represents a glimpse into a time and place in my past. 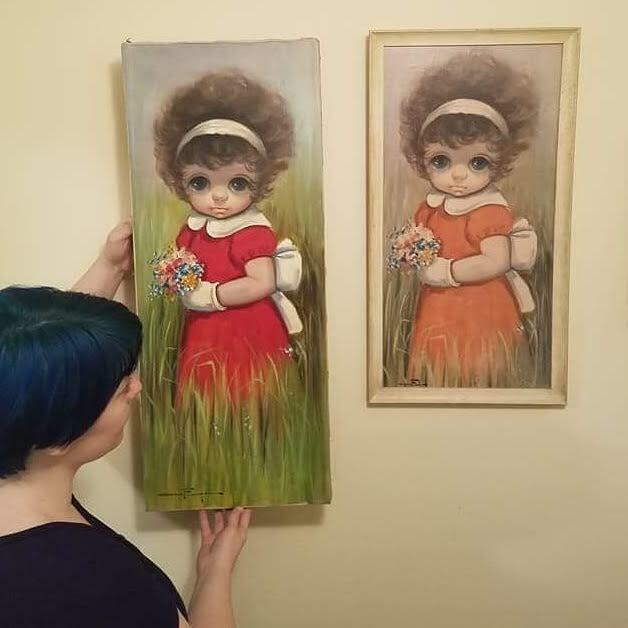 Sarah, a resident of Arizona, is comparing her Donald Art Company reproduction with her newly purchased Ozz Franca “Big Eyes” painting. Sarah, a collector, is proud to say that she now owns all four originals from this series. I could tell it was a reproduction and it’s been a mystery to me who Carter was and where the original painting was for the past ten years. During that time I would see other reproductions of it around, in hotels, it’s in the background of an episode of the Sopranos, office lobbies etc. But I could never figure out where the painting had come from—until this past weekend when I stumbled on that copyright information which led me to the website and finally to the original. So yes, there is a form of sentimental attachment and the mystery of the painting has been rather exhilarating. Now I just need to figure out who Doris Jean Norman aka Carter was and see if she, or her family, might have any insight into the creation of this painting! Thanks again Vivien, I’m very excited to finally own this piece of art.